Terry L. Ettinger Horticulture Consulting Services - Recommended Turfgrasses for Central New York Lawns. There are only about ten species of turfgrass that survive in Central New York lawns from one year to the next. 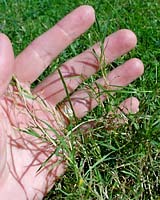 Several of these species are desirable including turf-type tall fescue, Kentucky bluegrass, the fine leaf fescues, and perennial ryegrass (from left to right in the photo above). Meanwhile zoysiagrass, annual bluegrass and the matted, toupee-like bentgrass (photo at left) are not particularly desirable. While I'll eventually devote an entire section of this website to caring for your lawn, I will describe these desirable - and less desirable grasses here. So, check back and I'll try to pull these descriptions together as quickly as possible. In the meantime, please send a self-addressed, stamped business-sized envelop to: "Lawn Care, 119 Concord Place, Syracuse, New York 13210-2649," to request copies of my popular "Central New York Lawn Care" and "Recommended Lawn Care Product" guides.